It looks like we will be grooving and shaking our way into spring. A touch of the 1960’s and a huge splash of 1970’s has inspired designers around the globe to bring back high waisted pants, billowy blouses, tailored blazers, florals, faux fur, tie dye and psychedelic prints. The 60’s & 70’s were tumultuous times. People wanted change and equality. The fashion was bold. Men and women were expressing themselves through clothing, protests, peace and love. Many designers showed us their groovy collections, such as Peter Pilotto, Derek Lam, Emilio Pucci, Tommy Hilfiger, Sonia Rykeil, Alberto Ferriti, Valentino and Roberto Cavalli. 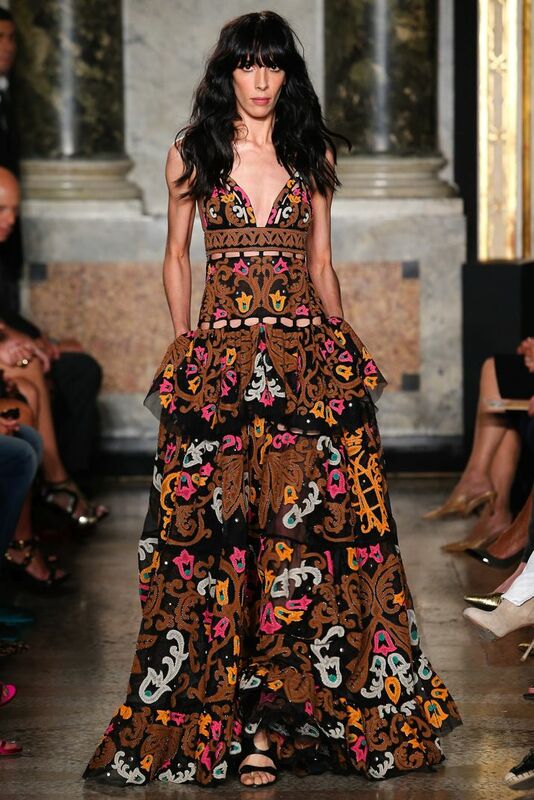 Pucci designed during the 70’s and has always used bold prints. They were basically just revisiting their fashion vault and updating their prints. Pouty lipped models wore sheer silk tie dyed maxi dresses, crochet tops paired with bold colored tailored jackets, oversized sunglasses and pants with a small boot cut. Natural wavy hair and light makeup went great with this hippy inspired collection. 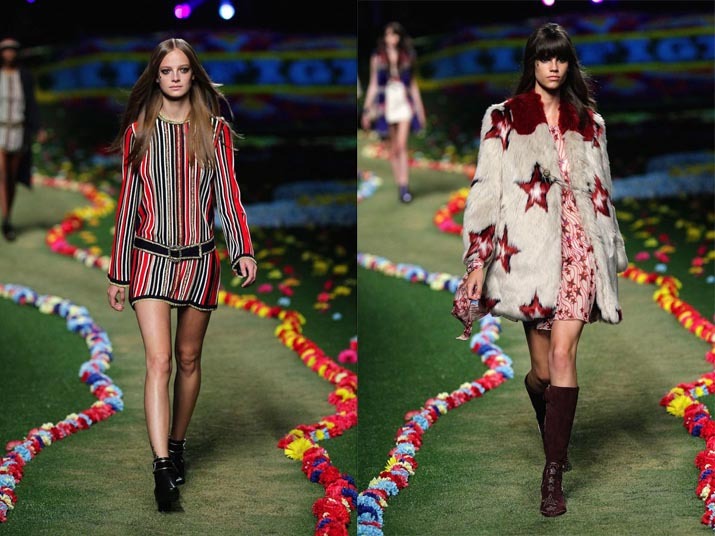 Short Shorts with tassels, jump suits and shawls with fringe also trotted down this flower powered runway. The gossamer dresses with prints and tie dye made the biggest wowzer’s during the show. Derek Lam has always adored the 70’s and has been inspired by the decade. I think he looked to the 60’s in this collection as well. He brought back the patchwork look introduced in suede low waisted skirts, dresses and jackets. His ready to wear had that old school classic American feel and simple seperates. High wasted pants, printed bloused, platform shoes, tailored jackets, pencil skirts, and cute simple dresses were the norm. Models makeup was mauve eyes with mauve lips and a touch of lavender, teal and prints amongst the neutral clothing worked extremely well. The topstitching on the suede along with big buttons demonstrated attention to details. Tommy Hilfiger created a magical dreamy runway and went all out sending custom vinyl record invitations. He channeled classic rock & roll and even had live drummers playing during the show. The models had smokey rimmed eyes, natural straight locks and tattoo stars on cheeks, wrist and ankles. Military jackets that looked fit for a Beatles member, epaulets everywhere,boot cut pants, short shorts, sheer star fabric, faux fur adorned with stars, strips, patch work denim, baby doll dresses, and sequined t-shirts were quite the change for the preppy Hilfiger most have come to recognize. I enjoyed this collection and personally I am glad he mixed it up. My mothers closet always had vintage 70’s clothing when I was a child and I grew up listening to Rock & Roll, so I for one am excited about the spring/summer trend. Can you dig it? The man can’t stop this fashion trend so lets get groovy this spring and summer.